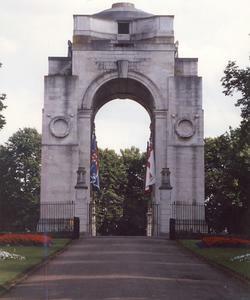 Triumphal arch. Large square monumental arch stepped at top and crowned with shallow dome. Coffered barrel-vault through with lower crossing vault. Four stone flags inside: the Union Flag and those of the three Armed Services. Whole is enclosed by railings and stone piers (see file for full description) Surrounding railings and rusticated gate piers with urns forming a circle. Underneath the arches hang carved and painted stone flags. Gates have been built on the two main approaches to it. Arch: GradeI listed (revised from Grade II* 21 June 1996); Lodges and gates onto London Rd: Grade II* listed; Gates and gate piers onto University Rd: Grade II* listed (revised from Grade II 21 June 1996. Final memorial was a revised version as insufficient funds had been raised for the original design. See file for full history of memorial. Lutyens and the Great War by Tim Skelton & Gerald Gliddon p.170 Published:Francis Lincoln Ltd 2008, Nov London Unveiled by Mrs Elizabeth Butler ( a bereaved mother who lost four sons killed, and two wounded). Built by Messrs Holloway. Leicester Mercury 25th November 2009.